In the pre-computer era, there were several decades during which lots of different companies created typewriters with wildly different keyboards. 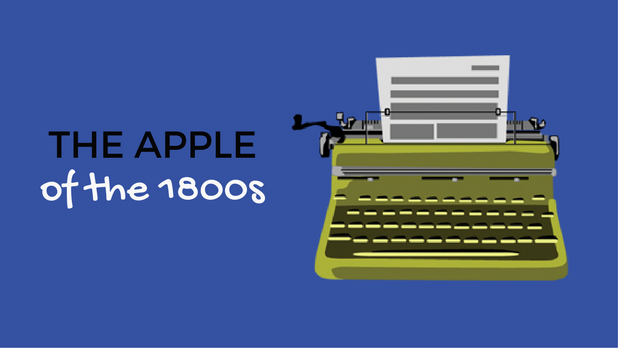 It wasn’t until the 1890s that the QWERTY keyboard used on Remington typewriters became a favorite. So just what were some of these early typewriters like? Below are a few of our favorites. The Hansen Writing Ball was the first typewriter to be commercially sold. This typing contraption looks nothing like the keyboards of modernity. Unlike today’s flat and linear keyboards, the Writing Ball is quite literally a ball covered with keys. Not incredibly practical, but VERY inventive. The Caligraph Two was the lightest typewriter on the market at this time. This is surprising because the keyboard was twice the size of what we’re used to today. Why? It had separate keys for lower and upper case letters. This peculiar looking typewriter doesn’t use a keyboard at all. Instead, a user swings a lever around on a dial to select the letter of choice and then presses the solitary key to strike the given letter. While a bit tiresome to use, this typewriter was small and could be transported relatively easily. Little known fact: for a time Ford dabbled in the typewriter business. The Ford typewriter was the first of its kind in that it used aluminum in its construction. It also, oddly enough, resembles the hood of a car. The Electric Blickensderfer was the first electric keyboard on the commercial market. While a good idea in theory, this product wasn’t very successful as electricity was still a relatively new phenomenon and voltage varied considerably from city to city. Plus… just imagine trying to get that name to catch on! In the midst of all these creative keyboards, the Remington keyboard gradually took hold as the commercial favorite. The Remington used the same sequence of letters that we find on the QWERTY keyboard today. Initially, it only typed uppercase letters, but eventually was adapted to tackle both upper and lowercase. And why the unconventional order of keys? The QWERTY keyboard was designed to make sure that keys didn’t get jammed during typing demonstrations. If a typist struct two adjacent letters at the same time, the typewriter was likely to jam. Thus, they moved common letter pairs such as “st” so that they were not next to each other. And it stuck. Before long all typewriter companies began to adopt the QWERTY keyboard. Even while computers continue to change and advance, and tablet’s gain ground over desktops, the QWERTY keyboard remains a steadfast fixture across all devices. At least for now, that is…. Wow Never Knew This About The Keyboards LOL!!! But Now That I Know Its Kind Of Interesting! !